The Mumbai rain is relentless as I stir through the weekend inertia to make my way through the cramped innards of Versova. The busy by-lanes of the city’s Bollywood hub, take my attention away from the spine-cracking rough ride over innumerable pot-holes, as I enter the modest looking and unassuming society, home to Anurag Kashyap, one of India’s most sought-after producer/directors, and his new bride Kalki Koechlin. Married for about five months now, the Law of Polarity seems to be in motion for this duo who evidently defy all clichés. While he is calm, brooding and a little intimidating, she is funny, energetic and welcoming. Together they complement the imperfections of each other’s rather au contraire personalities. And then just like that, instantly challenging the mental assumptions you have made of them, they assume opposite roles. She becomes the disciplinarian and the ‘man-in-charge’ of the house who dotes unconditionally on her unconventional director husband whose subject choices have always made him the topic of fevered coffee-table conversations, while he turns into a needy lover constantly contending for his pretty wife’s attention. Together they pack the perfect punch. As soon as the film wrapped up, he asked her out but unlike most happily-ever-after Hindi films, she refused. “I was extremely reluctant to go out with him as he was divorced with a child and was my director. It was all so stereotypical,” she smirks. But he wouldn’t take ‘no’ for an answer and pursued her for over two weeks, till she finally agreed to a dinner. “Once we met we talked for almost four-five hours, drank a lot of whisky, and realised that we both had a lot to say. It all grew very naturally from there,” says the besotted young bride. Anurag turns into his sombre best while reminiscing about the time. “She met me at my worst phase. During that period, I was dating random women, was surrounded by strange people and was doing odd stuff. But she never judged me and that was the most amazing part about her,” he says passionately. Marriage was too conventional for this bohemian belle, who was born in Pondicherry to French parents. She grew up amidst nature and her thinking has always been just as avant-garde as her looks in the archetypal world of Bollywood. She acknowledges that matrimony wasn’t really her thing and believed that two people could happily live together, but Anurag, thought otherwise and eventually persuaded her. Like in all relationships, marriage has brought in its share of adjustments. While it has set in a sense of security and commitment in her, the change in Anurag is there for all to see. “Ever since she has walked into my life she has changed it completely. She makes me do things I have never done. Initially I was always scared about these things but then I gave in and started enjoying them,” he explains, smiling for the first time since our chat. Work is what drives them. Films, art, literature and theatre have been the common passions that initially drew them to each other and even now strengthen that bond. Their strong individual personalities revolve around these passions and stand out in their uncluttered four-bedroom apartment discerningly done up by Kalki. 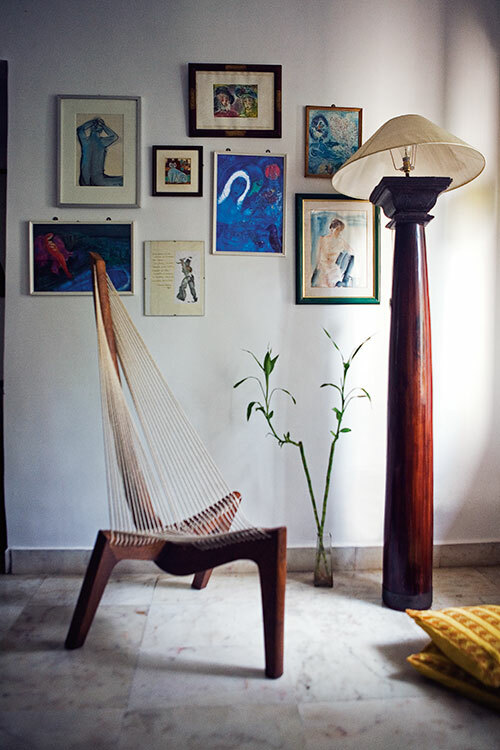 While one wall in the living room is decked with massive movie posters collected by Anurag from around the world, another small corner is dedicated to Marie Tissot, one of Kalki’s favourite painters. The colonial furniture handpicked by Kalki during their travels showcase her bohemian orientation. The room next to their bedroom has been revamped into a massive library full of books that vary from philosophical theories by Jean-Jacques Rousseau and Swami Vivekananda to modern mainstream bestsellers like The Catcher in the Rye and The White Tiger. What grabs my attention though is the adjacent room with opaque curtains. As I enter, I am astounded by the pack of neatly stacked DVDs of every genre possible. From gangster movies to horror flicks, from rib-tickling comedies to mushy romances, everything is here. The room has an air of Anurag Kashyap about it and no surprise that it is here he gets most of his inspiration from. “People ask me what inspires me and this is what it is, the cinema from around the world. Film makers doing films that they want to do, on topics we can never even attempt. We have an industry but its purpose is limited to productivity and returns; elsewhere cinema is looked at as an art form,” he rues. Though he personally prefers dark brooding gangster movies, Kalki acknowledges that she is a sucker for cheesy, romantic films. In fact, watching movies together on an idle Sunday is one of their favourite couple past-times. “We are discovering each other’s choices, so while he shows me Godfather, I make him watch Pride and Prejudice,” she says, matter-of-factly. And indeed, a couple who watches movies together definitely makes them together too. After their critically acclaimed Dev D, the couple came together for Shaitan which released earlier this year, a first-of-its-kind film on teenage angst and the rebellious attitudes of youth in our metros. It did well and struck a chord with the young and old in metros and smaller towns alike. Their latest offering That Girl in Yellow Boots has garnered much acclaim since it premiered at the Toronto and Venice Film Festivals. The film has been co-written by Kalki who Anurag feels is a brilliant writer with a strong yet sensitive viewpoint of things around her. “One should actually steal her poems and publish them,” he gleefully suggests. For now, things look bright and beautiful for the duo. While after Zindagi Na Milegi Dobara, Kalki has moved into the commercial heroine bracket, Anurag with his path-breaking films has changed the film-making game altogether showing the way to upcoming young directors and script-writers. Together they are settling in perfectly into the big bad world of Bollywood.